RAIDMAX, a computer chassis provider, is pleased to announce a Gundam themed chassis with an unique HDD storage design. Designed for ATX and m-ATX motherboards, the AGUSTA is ideal for gamers seeking an aesthetically striking chassis with numerous tool-less features and impressive cooling. In front of the five 5.25" bays with pop-off panels is the Gundam themed armor-shield. Opening like a door, this front shield gives the AGUSTA a visually striking appearance. When complemented by the front and top LED illuminated fans, the AGUSTA adds unmatched flash and appeal to your system. The upper compartment holds all your essential hardware including, the motherboard, power supply, two 2.5" SSDs, and up to five 5.25" drives. With the HDDs out of the way, the AGUSTA can house the longest VGA cards on the market. 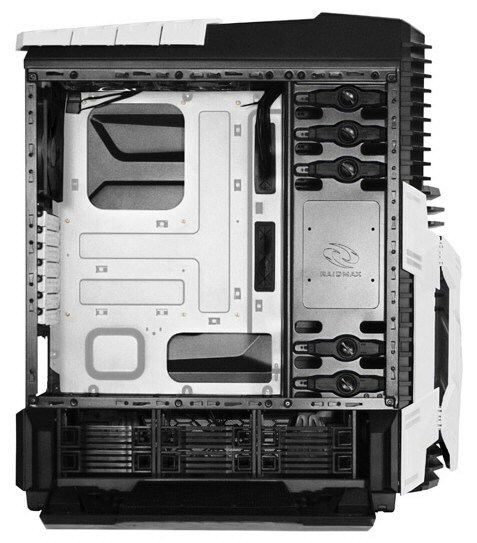 Future expandability is not a problem with the seven PCI slots, and the RAIDMAX AGUSTA even supports water-cooling with three rubber protected holes on the back panel. Located underneath the main compartment, the HDD bay supports up to six 3.5" or 2.5" HDDs. The HDD bay is easily accessible from both sides. With a simple pinch of the access tabs the honeycombed bottom side panel opens. The HDD trays tool-lessly slide out, allowing users to easily screw their HDD or SSD into the tray. Rubber protected holes on the ceiling of the drive bay makes it easy to connect all the wires to the motherboard in the upper compartment. With the separation of the HDD bay and seven fans in total, the AGUSTA is guaranteed to keep your system cool. The front 120 mm LED illuminated fan is specially designed to blow directly on the VGA card. More fans helping to circulate air unobstructed through the top compartment include: dual top 120 mm LED illuminated fans and a rear 120 mm fan. In the bottom compartment, which solely houses the HDD bays, one front 80 mm and two rear 80 mm fans ensure optimal running temperatures for your HDDs and SSDs. Out of the box, the AGUSTA provides pre-routed cable management for all the fans, LEDs, USBs, and audio connections. For your other wires, rubber protected holes let you guide all the cables to the roomy 25 mm space behind the motherboard keeping your system neat and organized. Too....much....plastic. This thing was taken out of Thermaltake's book. 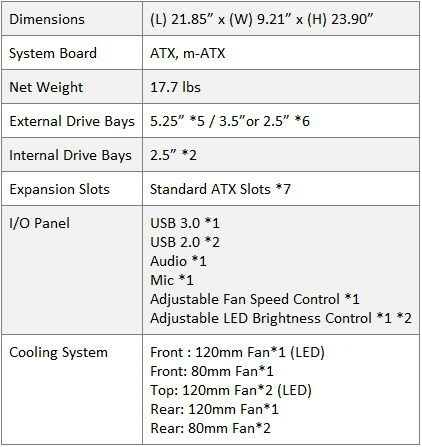 Also, it uses 80mm fans, why? And the general structure of it is just...weird. HDDs should have been two stacks of three, with the PSU in the lower compartment as well. 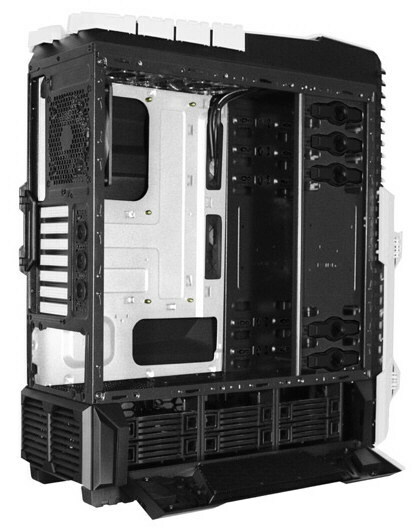 Maybe it would make the case slightly taller, but separate the PSU from the motherboard and allow for an eATX motherboard tray and rear panel. I actually love the looks, and if it was fully metal (with alum used for the "gundam" parts) it would've been even better looks wise (also, a lot more expensive), but there's just too many "why?!" decisions in this design. Raidmax is still in business so they must be doing something right. Also, it uses 80mm fans, why? Theory #1 : The brains trust at Raidmax probably saw the trend in chassis cooling fans going from 80 to 92 to 120, 140, 180, 200, 230...and thought that enough time had passed for 80mm to become retro. This is silly. Big and silly. it uses 80mm fans, why? Yes, I know. My point is why make the cage only tall enough for 80mm fans? Like I illustrated above, if they stacked the HDDs three-high in two stacks, they would've had room to place the PSU in the bottom compartment, and replace the front fan for that compartment with a 120mm one. Or just make it taller and add more drive space and change the fans to 120mm ones. raidmax makes good mid grade budget cases but this one is too OVER THE TOP as you could say. Its like a 16Yr old trying to impress a girl and he goes out and buys a H3 Hummer. This has to be one of the ugliest cases i have ever seen lol. 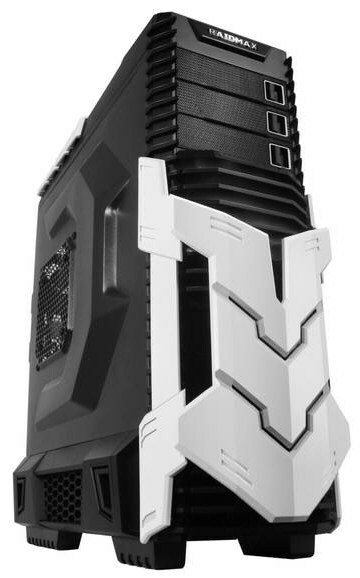 I prefer sleek cases, like lian li, although my next case will probably be a corsair 550d which is also very sleek appart from the rather hideous silver front thingy. RAIDMAX, un-announce this case and we'll forget we ever saw it, or hold it against you. I'm glad I'm not the only one who dislikes the silver front thingy. That case would be so perfect otherwise. Its good because it's nicely priced, just looking at the layout I think it's a full tower. 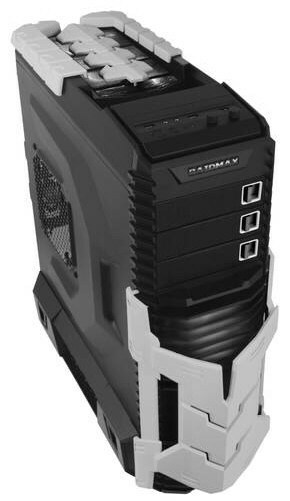 Or a Mid-tower case attached to a hard-drive rack on the bottom :P. At first look I was pretty disgusted but when I saw the price it gave me a much better impression, the design is ugly but it's definitely not a bad case at the price point. Although the antec P series or CM690 maybe worth a better look at. That black one does look pretty sick. To bad its not a full tower (10 pci brackets). I'd prob get one then. I think this case is good at it's design because it's not a common design. It has a good cable routing, as long as your creative. Let's say that you can put the extra cables in the HDD rack because you won't be using all of it. Maybe for two HDD are good enough, one SSD and a HDD. You can hide front panel connector at the hole of side case in the 5.25 bay. Buy more zip ties or Velcro ties much better and reusable to have better cable management.